Why was “Japanese Animation” Overwhelmed by “American Comic Movies”? I have lived in San Francisco for two years. While living here, I have participated in “Anime Expo” and “Comic-Con”, gone to movie theaters to see films based on American comics, and seen America’s subculture fans with my own eyes. I feel that there are two types of group in subculture fans, “American comics group” and “Japanese animation group”, and these groups have little overlap. The former group is mostly made up of men in their 40′s, and the latter is mostly women in their 30′s. Since they do not overlap, I haven’t seen men in their 40′s at Japanese animation events, nor seen women in their 30′s at American comic movies. Why did this happen? 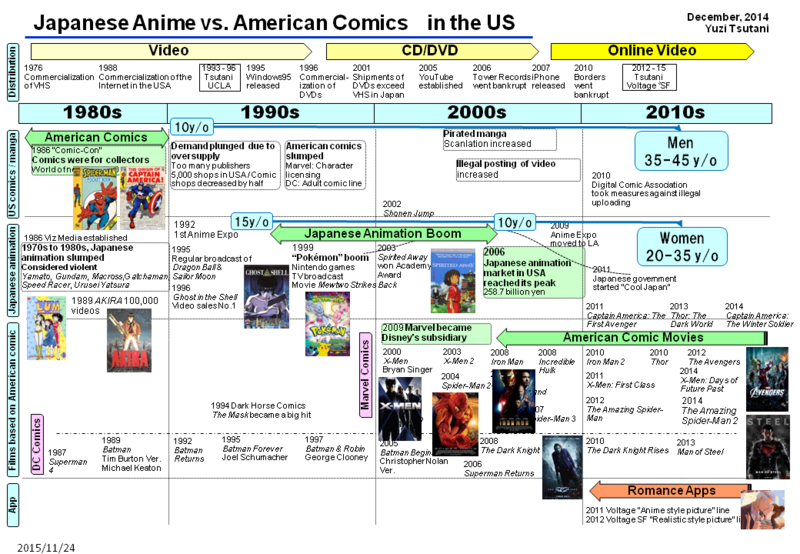 Research shows that the transition of booms from “American comics” to “Japanese animations” then to “films based on American comics” affected the fan demographic. In 1980s, American comics were considered collector’s items rather than for reading. They were bought like stocks with the prospect of an increase in selling price. General interest magazines were sold at supermarkets and kiosks, but American comics, which detested censorship, were sold at comic book specialty shops. Distribution was small-scale, with only 5,000 shops across America. The prices were raised yearly, but in the 1990s, the bubble burst and sales of American comics suddenly stopped suddenly, due to too many publishers and oversupply of low-quality comic books. While American comics experienced a downfall, in 1989 video sales of AKIRA surpassed 100,000 videos, and attention on Japanese animation increased. The “Japanese animation” boom began in 1995, and lasted eleven years. First, regular broadcasts of Dragon Ball and Sailor Moon started in 1995, and the following year, Ghost in the Shell marked top video sales in Billboard. I remember myself being deeply moved at seeing a wall full of Ghost in the Shell video packages at the Virgin Megastore in Hollywood. In 1999, Nintendo’s game “Pokémon” became a hit. It was made into an animated TV series which led to a big boom. The movie Pokémon: The First Movie: Mewtwo Strikes Back was produced and made 100 million dollars at the box office. It became the first Japanese movie to become a No.1 hit in America and ranked in the top 20 of the annual box office. And in 2003, the movie Spirited Away won the Academy Award for Best Animated Feature. But the boom peaked in the year 2006. The sales of Japanese animation in America reached 2587 million dollars, but it declined after that, and in 2012 it fell down to 2200 million dallors. The world had entered the Internet era and became infested with illegal posting of videos which stopped the sales of DVDs. Floor space for DVDs decreased and Tower Records went bankrupt. Animation was still very popular, but there weren’t many people who paid to watch anymore, and businesses downsized. After 2005, American Comics Struck Back with “100 Million Dollar Movies”! During the Japanese animation boom in the late 1990s, American comics were in a slump. Two major publishers didn’t give up and continued their trial and error. Marvel Comics explored character licensing and DC Comics explored an adult comic line. It took a long time for them to bear fruit, but in the 2000s it sparked a boom with “films based on American Comics”. Marvel made a hit with the X-Men series which started in 2000 and Spider-Man series (directed by Sam Raimi) in 2002. With that momentum, it financed 50 billion yen from Merrill Lynch. Then, it started the Iron Man series in 2008, followed by The Incredible Hulk, Thor and Captain America. In 2012, it invested 200 million dollars and released The Avengers assembling all characters. The movie became a huge hit, making 1500 million dollars at the worldwide box office. These movies were produced by Disney, but Marvel became its subsidiary in 2009. Marvel continued to advance, making great hits with The Amazing Spider-Man series in 2012 and Guardians of the Galaxy in 2014. On the other hand, DC Comics was not to be outdone. It became the subsidiary of Warner at an early stage, in 1969, and advanced the film adaptation of Batman and Superman. In the 1990s it produced Batman movies starring Michael Keaton and George Clooney, and in 2005, as a reboot, started the trilogy with Batman Begins directed by Christopher Nolan, starring Christian Bale, which became a great hit. And in 2006, a reboot of Superman started too. I’ve seen most of these movies, but I was stunned by the fact that 20 SFX-packed movies with production cost of over 100 million dollars each were produced in fourteen years. The business scale is beyond comparison. For Japanese animation, production cost is about 5 million dollars per film. The above-mentioned Pokémon’s production cost was 3.5 million dollars. It is said that a large amount of money is invested into Ghibli films, with a production cost of 20 million dollars for Spirited Away and 34 million dollars for Ponyo, but their release pace is one film in two years. The production costs of films based on American comics are about five to ten times more than Japanese animation films, whether for one film or for the whole industry. The gap is too big to overcome with ideas or technologies. By the way, why did film adaptation of American comics happen? It is only my speculation, but I believe it was like this: Seeing the Japanese animation boom convinced American comic publishers were convinced that animation could be a huge business. However, in America, comics were still thought of as something for children and nerds. So, in order to attract adults and the general public, they decided to make live-action films in cooperation with Hollywood instead of making animation films. In fact, the audience of Pokémon movies was mostly families, but the audience of films based on American comics was mostly young adult groups. The age difference between “American comic group” and “Japanese animation group” is due to the ten year gap between the American comics bubble and Japanese animation boom. From the perspective of gender, American comics have more male fans because of the full blast battles depicted in them, and Japanese animations have more female fans because they describe the subtleties of feelings. Recently, in order to gain female fans, American comic movies have started to put in effort in featuring female characters like Mystique and Black Widow. Judging from the look and number of people at events and movie theaters, the number of people and gender rate will be as shown in the following table. However, given the percentage of usage and purchase, the market size of app payers will probably be almost the same, even though the parameter is twice as big. With Pacific Ocean in between, Japanese and American manga and animation industries have built growth spiral together for a long time. In the past, Osamu Tezuka was astonished by Disney films and created the first animated feature film called Astro Boy. And modern film director James Cameron was inspired by Ghibli movies and created Avatar. copyright © 2019 Yuzi-Tsutani. All Rights Reserved.